While enjoyable, informative and inspiring, I’ve been reading this book so slowly that the lending period expired. Assuming that I’m able to check it out, I will definitely finish it this week. What are you reading this week? Are you like every other person in America who’s already read the entire Hunger Games trilogy? To read more of my thoughts, follow me on Twitter. For more book reviews, books I’ve read and books I want to read, find me on Goodreads. And of course, don’t forget to check out my Pinterest to see all the craft and home decor projects I’ll probably never do and some cool book and social media pins. This entry was posted in books, culture and tagged Catching Fire, pop culture, Suzanne Collins, The Hunger Games, Todd Henry, weekly reads. Bookmark the permalink. Oh, I’d love to learn how to be brilliant 😉 I hope you have a great week of reading! I certainly need to discover how to be accidentally creative. Off to add to my important book lists! It’s a great book so far. It’s not a magical formula or anything, but it just covers the basics of how to prepare oneself for maximum creativity. Thanks for commenting! I often avoid the hype, but I gave in on this one. The story is great. It’s not terribly well written, though. I’m sure I might piss some people off by saying that! 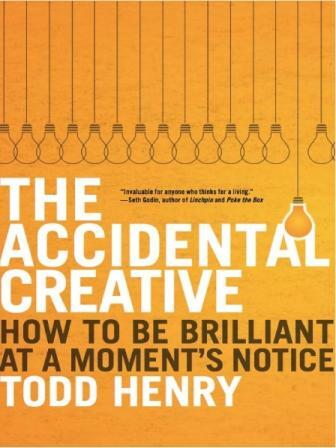 Love the sound of The Accidental Creative….enjoy! I hope to be able to share a review of it in a few weeks. Thanks for commenting! Thanks! I hope you have a great reading week as well! I’m one of the few people who haven’t read, or seen, any of the Hunger Games Trilogy. Happy reading! I help off for awhile, but I eventually gave in to reading it! Hunger Games is a page turner, in audio it has to be incredible. It’s definitely an entertaining read!